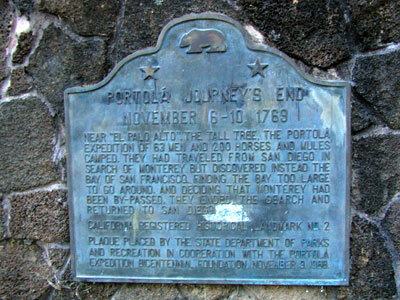 Near "El Palo Alto", the tall tree, the Portola expedition of 63 men and 200 horses and mules camped. They had traveled from San Diego in search of Monterey, but discovered instead the bay of San Francisco. Finding the bay too large to go around, and deciding that Monterey had been by-passed, they ended the search and returned to San Diego. Intersection of E Creek Dr and Alma St, Menlo Park. 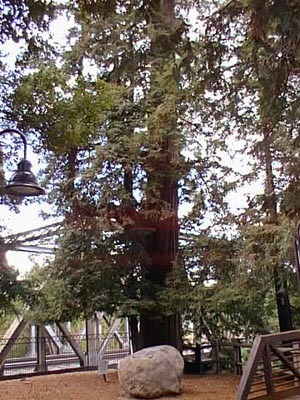 The plaque is located on Alma St in Menlo Park, but the site itself is actually in Palo Alto in Santa Clara County. It's across a footbridge on the other side of the creek that's the county line.